Five years removed from the unfortunate “Last Stand,” the X-Men were a superhero brand ripe for a reboot. And if you’re gonna crank up the old magic factory, why not set the Wayback Machine for the 1960s, giving yourself a fresh 50 years to work with? 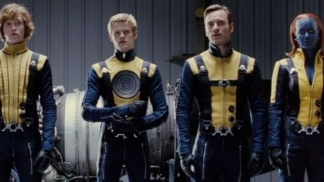 But all snarky cynicism aside, “X-Men: First Class” is a worthy do-over for a once-great franchise. Beginning in 1944 and going through to the (secret) conclusion of the Cuban Missile Crisis, “First Class” follows Erik Lehnsherr/Magnet (Michael Fassbender) and Charles Xavier/Prof. X (James McAvoy) from their very different youths, to their inevitable meeting and unfortunate parting of ways. Along the way, mutants from across the globe are forced to take sides—against each other and mankind. Fassbender as Lehnsherr and Kevin Bacon as Sebastian Shaw, leader of the nefarious Hellfire Club, are the anchors that keep “First Class” grounded. Lehnsherr on the hunt for Shaw offers some of the film’s best scenes, with Fassbender a heat-seeking missile of vengeance determined to push through any obstacle until he has Shaw’s head on a pike. Bacon, meanwhile, brings the perfect blend of devilish glee, bad-guy swagger and power that you look for in a super villain. McAvoy is excellent as Xavier, the earnest, wannabe-ladies man with an inexplicably unshakable faith in Mankind (but can someone explain why he's always wearing those fingerless hobo gloves? Yes, he needs to be able to touch his fingers to his temples to use his telepathy, but it’s not even cold outside, for heaven’s sake). A scene where we watch him try to pick up Moira McTaggart (Rose Byrne—how hard is it to find a leading role for this woman?) by explaining the science behind her auburn hair is pretty funny; and watching him root for humanity, you almost want to share his belief in our better angels. A globe-skipping good time that takes us to Switzerland, Argentina, Vegas and Oxford, and an old-school Cold War adventure unfortunately bookend a second act that drags on forever. Director Matthew Vaughn tries to get us invested in every new X-Man, show us that mutants need loving too, and offer all other manner of obvious, unimportant insights about the universal truths that guide all our hearts. Yawn… can we please go end the Cuban Missile Crisis already? “X-men” has always been about Good vs. Evil, with the specter of the Holocaust as a reference point for the seemingly inevitable showdown between the human race and the mutants. Watching Lehnsherr and Xavier argue about whether or not there is such a war on the horizon, it’s hard not to see Lehnsherr’s point—we humans are weak, venal, dumb, brutish and inherently violent, and the only way to stop us is to kill us. And yet, despite its sorry outlook, “X-Men: First Class” is fun adventure loaded with great heroes, better villains and some epic battles--and isn’t that what you’re after?